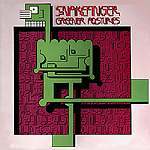 This is the only Snakefinger/Residents CD I've ever heard that can actually be placed in a spot in musical history. This disc is totally P.I.L./Talking Heads/Kraftwerk era so far as synth sound and musical experimentation goes, which is in no way dissing the album. It's just that most of Snakefinger's material seems timeless to the point of futuristic, even now, and this sounds like something out of the early '80s. Nice thing is, though, that the remastered version of this album is completely up to today's standards, so it doesn't sound like you're listening to some barely-stereo scratchy piece of vinyl recorded 30 years ago.